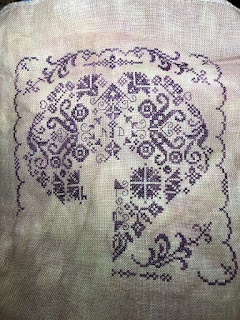 I put in almost no stitches on a travel project - A Bowl Full of Scaries from Plum Street Samplers. Seriously - I finished up the tree and started the second one, and started the snake border. I'm not sure why I think I'll be able to have the mental focus to work on stitching projects after a day on the trade floor, but I haul one along every.single.time. Clearly, however, I do not. Nicely enough, my random number generator felt I should get a second crack at this one, so it's also on tap for next month for a 5-day rotation. As usual, I did put in 5 days on my Desert Mandala from Chatalaine. I'm concentrating right now on the upper landscape section. I got the border mostly worked for that and started filling in some of the rocks - absolutely LOVING the colors in this one! Finally, my handy-dandy random number generator picked Shoot the Moon for me to work on for the remaining 5 days of April. This is another Heaven and Earth charted piece, a mini with the background removed. I'm stitching it on a gradient hand-dyed evenweave using all the same color - 310 - for the stitches. The fabric color is a bit washed out but I did get the central figure started this time around. Very happy with the progress on this one! Woefully behind in updating the blog - it's been crazy busy with travel and shows and work, but I have been reading. I'm just going to do a truncated "Here's what I read" post and not a full review in the hopes I can then get caught back up going forward. 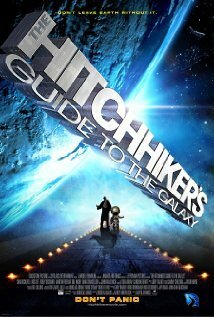 For week 38: A science book or science fiction book, A Hitchhiker's Guide to the Galaxy by Douglas Adams. 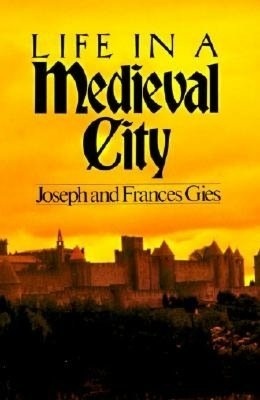 I read this in high school originally - my high school boyfriend was very into this series - but it had been a while, so I picked it up as a re-read. 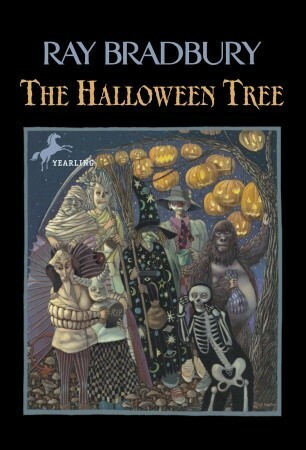 For week 30: A short book, I read Ray Bradbury's The Halloween Tree. And finally, for week 24: A book with a map, I read Life in a Medieval City by Joseph and Frances Gies.